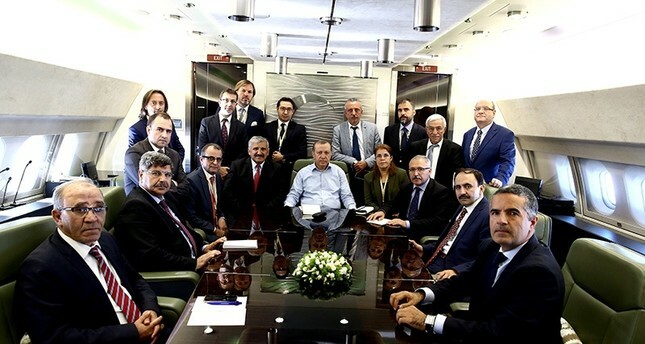 President Recep Tayyip Erdoğan, speaking to journalists on the Presidential Plane on his way back to Turkey from New York where he attended the annual opening of the U.N. General Assembly, said the most effective fight against Daesh was waged by Turkey contrary to the concerted disinformation campaign. The Syrian crisis remained the top priority of world leaders, argued Erdoğan, adding that he himself had explained the current state of affairs in the country to all those who asked. "I had a phone conversation with [Russian President Vladimir] Putin yesterday [Thursday]. We talked about the airstrike on the aid convoy going to Aleppo. Evidence points toward the Assad regime being responsible for the attack." He strenuously objected to identifying Daesh as an "Islamic State." "Such a terrorist group cannot be linked with Islam in any way. Abbreviations such as ISIL or ISIS contain the words 'Islamic State.' This is unacceptable. That's why we call them Daesh." Daesh is a pejorative word that means "one who crushes something underfoot" and "Dahes," translated as "one who sows discord." The group threatens to execute anyone who uses this term. He explained that Operation Euphrates Shield was initiated to rid the border region with Syria from terrorist presence and would continue until this objective was achieved. "There is a coalition of 65 countries founded to eliminate Daesh. Nondesire to achieve this objective is the only way not to achieve it. If there is a true desire to eliminate Daesh, Turkey and the U.S. should cooperate and do it. There are 10,000 Daesh members in Syria. Let's say there is an equal number in Iraq. If Turkey and the U.S. can't handle such a group, shame on them. If we pool our resources, we'll finish this job." He said: "To eliminate terrorist groups, arms arriving from coalition countries should not be directed at Turkish tanks but at Daesh, the[terrorist PKK's Syrian affiliates, the Democratic Union Party] PYD or [its armed wing, People's Protection Units] YPG targets. However, what we see is that German-made MILAN weapons are hitting our tanks." Turkish military officials are in touch with their American counterparts on a possible joint military operation against Daesh's headquarters in Raqqa, Erdoğan said. "We have shared with them our preconditions to join this operation." However, the U.S.'s attitude toward the Raqqa operation is yet to be clear, he noted. "If the U.S. wants to conduct the operation with the PKK's Syrian offshoots, the PYD and YPG, Turkey will definitely not be a part of it. If not, we will surely support it." Officials from the military, Foreign Ministry and intelligence will deliberate on various plans once the U.S.'s attitude becomes clear, Erdoğan said. "Another sensitive topic is the freeing of Mosul, where Arabs and our Turkmen compatriots live. Whether the U.S. shares our sensitivities or not, I don't know but their attitude seems positive. It is said that a military operation to free Mosul will be launched on Oct. 19. We'll see what happens." However, Turkey, which is hosting millions of refugees from Syria and Iraq, needs to be ready for all eventualities, argued Erdoğan, adding that cooperation between Arabs and the Kurdistan Regional Government's (KRG) peshmergas who benefitted from the train-and-equip program was of paramount importance for the Mosul operation. He said the U.S. administration's policies on Syria were so confused that when he asked U.S. Vice President Joe Biden about two plane-loads of weapons delivered to Kobani for the PYD just a few days ago, he claimed ignorance. "I told him, 'You say that but I know it.' How can this happen? Only the next day [Secretary of Defense Ash] Carter said, 'We hand them weapons and will continue to do so.'" Moderate Free Syrian Army (FSA) fighters continued to make progress against Daesh, Erdoğan said. Contrary to what U.S. cooperation with the PYD wants to achieve, the region was populated by Arabs, who make up95 percent of the population of Manbij, Erdoğan said. "After Jarablus was freed by the FSA from Daesh, locals who fled returned to their homes. The same thing is happening in Manbij. With Turkish military support, the FSA has freed al-Rai. It will free al-Bab." He said PYD presence in Manbij was minimal but even this will be gone once the region is secured. Turkey is suggesting the formation of a safe zone in a 90- to 95-kilometer corridor with a depth of 40 to 45 kilometers across the Syrian border, Erdoğan said. "If it is declared a safe zone and we are given monetary aid, we can build housing there. Refugees in Turkey and those still fleeing from violence within Syria can be housed there. We also plan, in cooperation with Saudi Arabia, to build 10,000 units within Turkey close to the Syrian border. We aim to stop refugees living in tents." On the matter of a safe zone, "The U.S. has been supportive since the beginning. [Russian President Vladimir] Putin did not object when I mentioned it. What's important is support from all 65 members of the coalition. Our Foreign Ministry officials will work to secure this. Once the funds arrive, we can immediately launch the building projects." When U.S. Secretary of State John Kerry's no-fly zone suggestion was mentioned, Erdoğan said, "That's where everyone will eventually meet. There is no other option." Turkey's policy was the establishment of a safe zone and a no-fly zone while initiating a train-and-equip program for moderate forces in Syria, Erdoğan underlined. Erdoğan said no matter where the leader of the Gülenist Terror Group (FETÖ) fled, Turkey will be pursuing him. There were reports about Fethullah Gülen planning to flee the U.S. where he has been sheltering for years, Erdoğan said, dismissing such schemes as useless because Turkey would pressure whichever country he fled to to extradite him. "Even if they go to another country, they'll eventually lose because my people have realized the true danger posed by this group. The process advances to their disadvantage." There has been an extensive judicial offensive against FETÖ, the terror cult behind the failed July 15 coup attempt, while the government has been trying to secure the extradition of its leader from the U.S. Washington's failure to accelerate the process has been criticized, along with the continued freedom enjoyed by Gülen. Erdoğan, in his speech last week at the U.N. General Assembly, emphasized the danger posed by FETÖ, which has presence over 100 countries around the world. "If it had not been for my nation, I wouldn't have been here," he said during the speech. When asked whether any of those he talked to during his stay in New York admitted their failure to take FETÖ or its coup attempt seriously, Erdoğan said, "Of course. Many came up and acknowledged their mistakes. However, what's important is what they do in practice. During this process, it was Qatar that acted most candidly. From the moment it happened, we have always been in contact with them. The Qatar emir's father came. So did the Qatari prime minister and foreign minister. The visit by the Council of Europe general secretary [Thorbjørn Jagland] was also important. It is natural to expect people to come and visit at difficult times. I had hoped those who went to Paris to stand shoulder to shoulder with the French people after the terrorist attack there to come and show solidarity with the Turkish people after the July 15 coup attempt. This was no simple terrorist attack. It was a terrorist group's attempt to topple democracy-loving Turkey. I sincerely hope everyone learned a valuable lesson from what happened." Erdoğan also said their efforts to inform all countries of the danger posed by FETÖ was continuing determinedly. On the issue of the protracted extradition process of Gülen, Erdoğan spoke about U.S. officials presenting the judicial process as the reason behind the delay. "Their message is that all the documents we sent will be assessed by courts and if they approve, the government will do what is necessary." During his meeting with Vice President Joe Biden, Erdoğan said, he raised the issue of the continued incarceration of Turkish businessman Rıza Sarraf on charges of conspiring to evade U.S. sanctions against Iran. "This person is a Turkish national. He was arrested the moment he entered the U.S. while he was accompanied by his wife and child, who were sent back to Turkey. As with any Turkish national, we need to ensure everything is done in accordance with the rule of law, just as the U.S. would do so if the same thing happened to its own citizen in Turkey. Moreover, investigations by our Justice and Economy ministries show that this person is not guilty of the charged crimes. Iran says the same thing. Still, this person has been in jail in the U.S. for the past six months." Erdoğan also pointed to an interesting fact about the court and the prosecutor handling the case. "Both Judge Richard Berman and Prosecutor Preet Bharara visited Turkey as guests of FETÖ in the past. In other words, Sarraf is in the hands of people pampered by FETÖ at one point." When Biden was told, Erdoğan said, the vice president admitted that he had no idea. FETÖ was also behind the Dec. 17 and Dec. 25 coup attempts against the government, when the cult used its operatives within the judiciary and the Police Department by using spurious charges. When asked why the U.S. was procrastinating over Gülen's extradition, Erdoğan said, "It is you who should comment on that. We are doing everything necessary to secure his extradition. We explained the matter to [President Barack] Obama and Biden. We sent them 85 boxes of documents on the Dec. 17 and Dec. 25 coup attempts. We are also sending documents on the July 15 attempt. The justice ministries of the two countries are in contact." On the ongoing fight against FETÖ, Erdoğan compared the group to cancer. "It has metastasized. Until the last remaining cancer cell is removed, we can't declare ourselves safe from the disease. The process of weeding out FETÖ-linked public servants is continuing. The failure of the Republican People's Party (CHP) Chairman [Kemal Kılıçdaroğlu] to share the urgency displayed on the matter by the Nationalist Movement Party (MHP) Chairman Devlet Bahçeli is unfortunate. The purpose of the State of Emergency is to ensure the anti-FETÖ fight is effective. We know they have infiltrated many state institutions. The fight will continue until thevery last Gülenist operative is removed from state institutions. We have made significant progress." He said the Dec. 17 and Dec. 25 attempts were executed by Gülenist operatives within the judiciary and police. "They failed. What did they do next? They instigated a coup attempt through their operatives within the military. They had to bring their plans forward because they deduced that something was going to happen at the Supreme Military Council (YAŞ) meetings in August." The YSK is the main board where promotions and dismissals from the military are decided. FETÖ is believed to have surmised that most of its operatives within the military were going to be removed at the YAŞ meeting in August, bringing forward the launching of the coup attempt. "They smashed into a wall because of their miscalculation. Our people rose up against them. Two-hundred-and-forty-one people died and 2,194 people were injured. However, our people made history." Among the heads of state and government with whom Erdoğan held one-on-one meetings during his visit to New York were the emir of Qatar, Saudi Arabia's crown prince, presidents of Ukraine and Slovenia and theprime ministers of the U.K., Pakistan, Greece and Japan. He also met with the representatives of various Turkish nongovernmental organizations, American Muslim and Jewish groups, and a delegation of American businessmen led by Michael Bloomberg. Erdoğan said the Syrian and refugee crises were the center of focus during his U.N. meetings. "The refugee crisis is a shame for the entire humanity. Each country is trying to view this matter from its own narrow lens. We explained the state of refugees fleeing Syria and what we believe should be done to address this tragedy." Erdoğan repeated his call for reforming the U.N. to make it more effective toward the many crises faced by the world. His thesis, "The world is bigger than five," calling for a change in the permanent membership system in the U.N. Security Council, aims to prevent any one of the five permanent members to block initiatives for the benefit of humanity. Erdoğan said a change in the permanent membership system was on the agenda, with many leaders voicing their opinion that such a reform was crucial. "Even on issues such as fighting terrorism, any one of the five permanent members can block progressive moves. There are leaders who do not see the PKK and its Syrian offshoots as one and the same." Erdoğan said there were efforts by several countries underway to rectify this injustice, voicing his hope that these efforts will eventually lead to a comprehensive overhaul of the U.N. system. Another topic Erdoğan underlined during the interview was the U.S.House of Representatives decision to approve a law that will allow the relatives of the victims of the 9/11 attacks to launch compensation claims against Saudi Arabia. The law was vetoed by President Barack Obama but still his veto can be revoked. "As Turkey, we cannot approve of such a decision. The entire country cannot be held responsible just because a few Saudi nationals committed a crime. Let me give you another example. The leader of FETÖ lives in the U.S. and all can see the terrorism waged by this group. Should we punish the U.S. for that? Can we pass a law in Parliament to demand compensation from the U.S.?" He described the law as a great injustice toward Saudi Arabia and that he had communicated his opinion to Biden. "I also told Biden that Turkey, as the term-president of the Organization of Islamic Cooperation (OIC), would soon be making a statement to that effect. Erdoğan argued that in his meetings with businessmen and the CEOs of top companies, no one uttered a word about loss of investment opportunities in Turkey. "It is true that I don't take what ratings agencies say seriously. Such ratings agencies report on demand and so are not trustworthy. While these agencies try to find faults in Turkish economy, they raised the rating of a country nearing bankruptcy by four levels. Witnessing such behavior precludes anyone from taking their opinions seriously." On business relations with Israel, Erdoğan said energy ministers from Turkey and Israel will be meeting next month during the World Energy Congress to be held in Istanbul between Oct. 9 and Oct. 13. "This meeting was postponed twice. I believe it will finally take place next month. Steps to be taken will become apparent after that." Cooperation on natural gas between Turkey and Israel has been under discussion for some time.